Thyme: Restaurant Review: Café des Amis...gateau love! 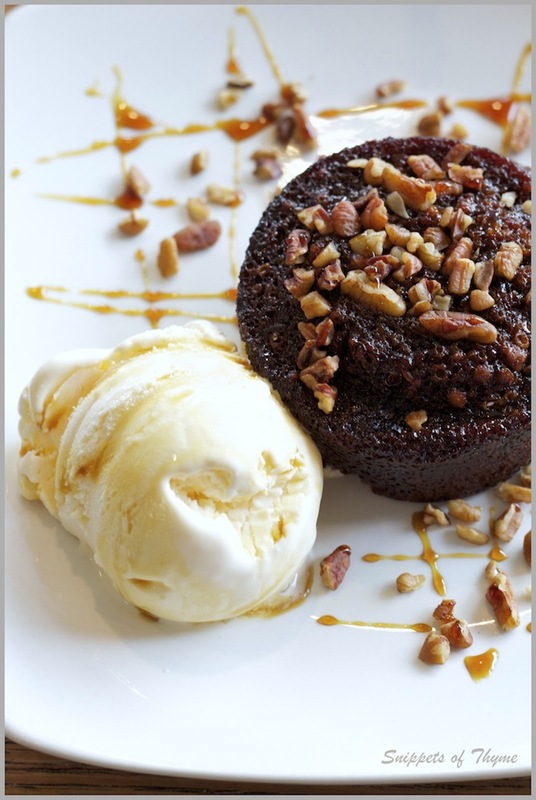 Restaurant Review: Café des Amis...gateau love! I have discovered my all time favorite dessert. If I had just one last dessert wish, this would get the call. This gateaux won't win any beauty contests but the flavors of it are amazing. It is...Gateau de Sirop. 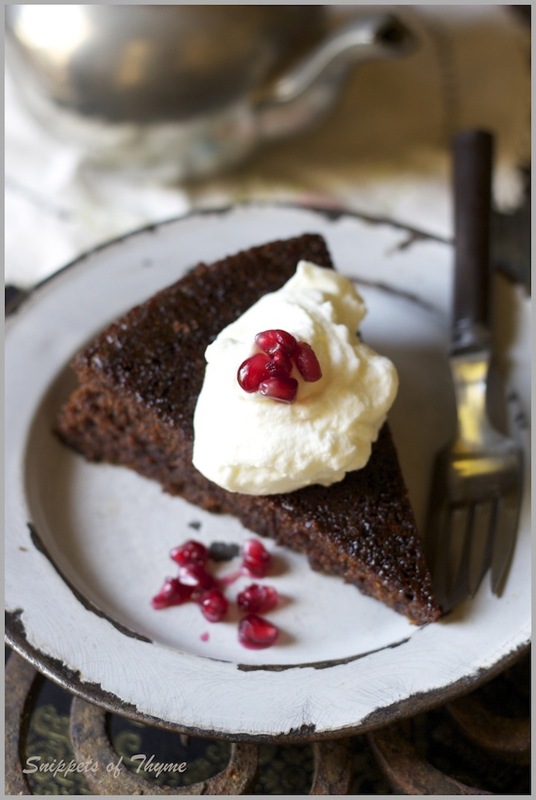 I could wax poetic about the beautiful molasses and spice flavors in this somber and humble looking cake. Before it even went into the oven, the heavy aromas of molasses, cane syrup, cinnamon, ginger, cloves, and vanilla steeped the kitchen. We filled pantry containers with slices of this gateau. Therefore, I will, most assuredly, be tucking into a slice every afternoon this week with my afternoon cup of tea. This dessert hit my culinary radar because it carries a story with it. It's probably evident that most dishes I cook arrive in my kitchen attached with memory or experience...a story. On our weekend away to cajun country, I ordered it for dessert at a little jewel of a local family owned restaurant. I not only fell in love with the dessert but also with the entire restaurant. I decided this restaurant stop would most assuredly be shared on "Snippets of Thyme". 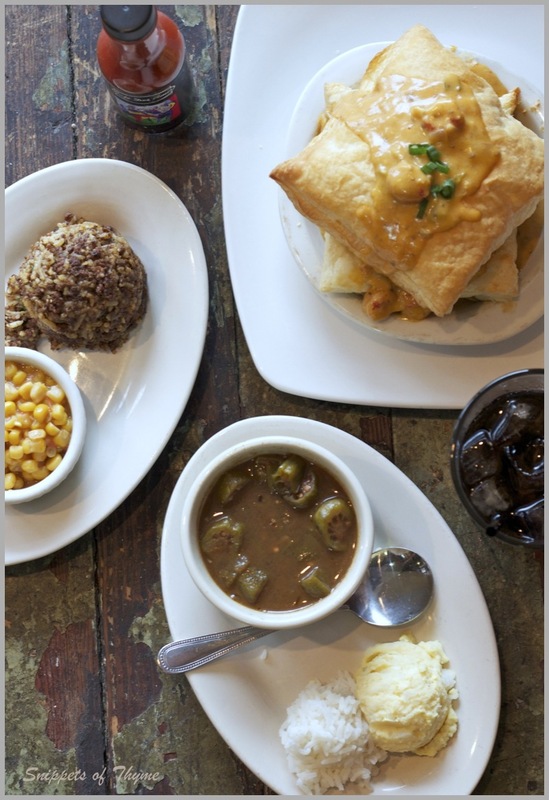 I am truly pleased to introduce a most authentic cajun restaurant tucked away in the tiny cajun town of Breaux Bridge, Louisiana- Café des Amis. 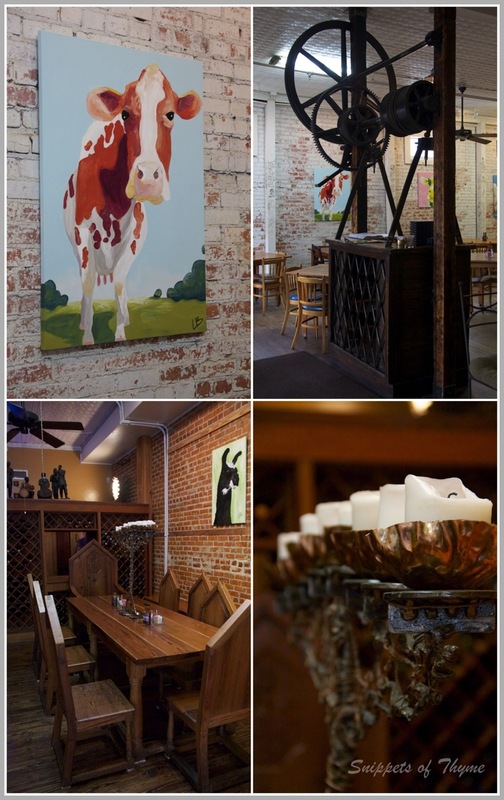 Café des Amis is an airy and artsy restaurant that hums with a definite urban vibe. However, it is situated right in the core of a quaint old-fashioned downtown street that could have been the filming location for Mayberry in the old T.V. program "The Andy Griffith Show". I have not been this delighted by a restaurant for awhile. 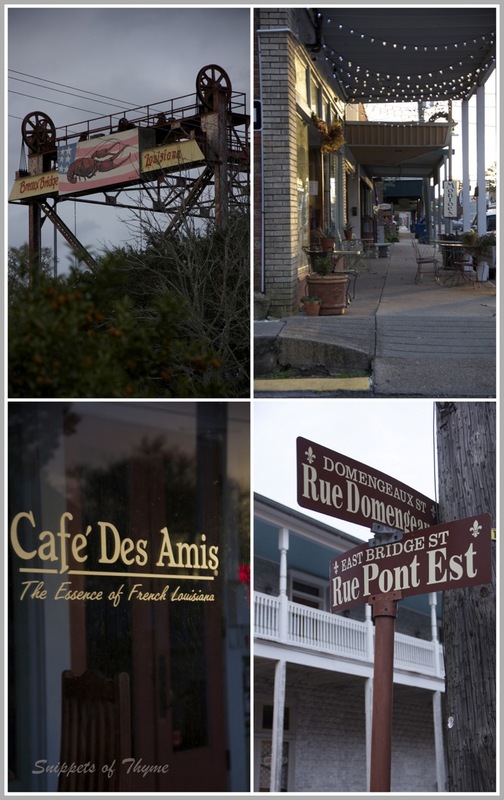 Before deciding on where we should stay for our weekend away, I browsed the online menu of Café des Amis. One quick glance at the menu had me intrigued and my taste buds tingling, so we booked ourselves into a B&B right around the corner that I highlighted here. It's not that easy to find quality cajun food outside of a home kitchen. There is the "blackened this...and overly spiced that" that has become the popular notion of cajun food. 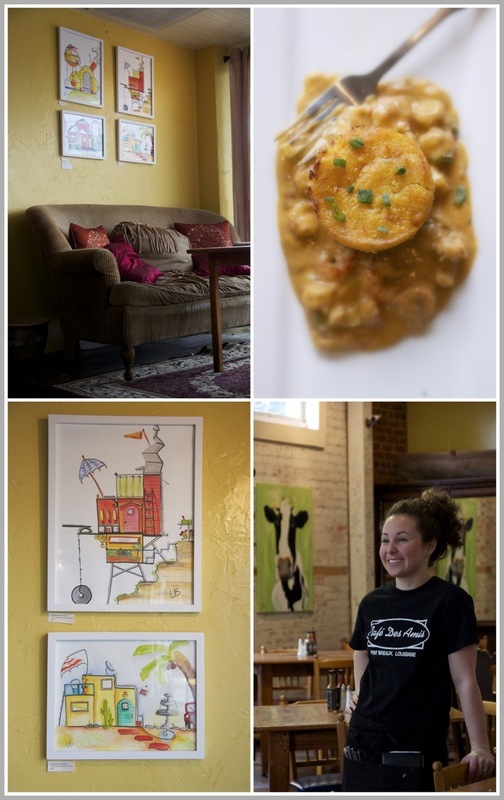 But, then stands this wonderfully authentic cajun restaurant that serves dishes untouched over time. The menu that is served at Café des Amis carried me straight back to the foods as I remembered them from my childhood growing up in Louisiana. When plates arrived at the table, the first dish my fork wandered to was the 'rice dressing' side dish. It is imperative in cajun cuisine that the rice dressing taste spot on. First bite... I sat back and congratulated my taste buds. Perfect blend of gaminess, spices, and herbs. If they can get rice dressing 'right', then this was going to be a gratifying and delectable gastronomic holiday for me. I ordered one of the appetizers on the menu. It was a round of crawfish cornbread sitting in a pool of spiced creamy crawfish sauce. The cornbread was moist with just the right amount of spicy 'kick'. It was a wonderful cake-like consistency for scooping into the creamy crawfish. One of my favorite parts of traveling is hearing the stories behind the people who are local. Nothing gives me more pleasure than eating good food and hearing someone tell a local tale from their part of the world. So, here is where I met Logan. Logan is a bright eyed-cheery girl who made me feel completely at home in this restaurant. As I was commenting on the fun and whimsical artwork on the wall - she quietly informed me that she was the artist behind them. "You painted everything in this restaurant?" I asked wide-eyed. "Most of the animal and city-scape paintings" she answered with a sweet and unassuming smile. We chatted away while I tucked into the delicious rice dressing, cornbread, crawfish sauce, and bowl of shrimp and okra gumbo. Her paintings would be fun additions to a kid's bedroom or a funky ice cream or coffee shop. I asked her where they could be purchased and she lead me to her site here. 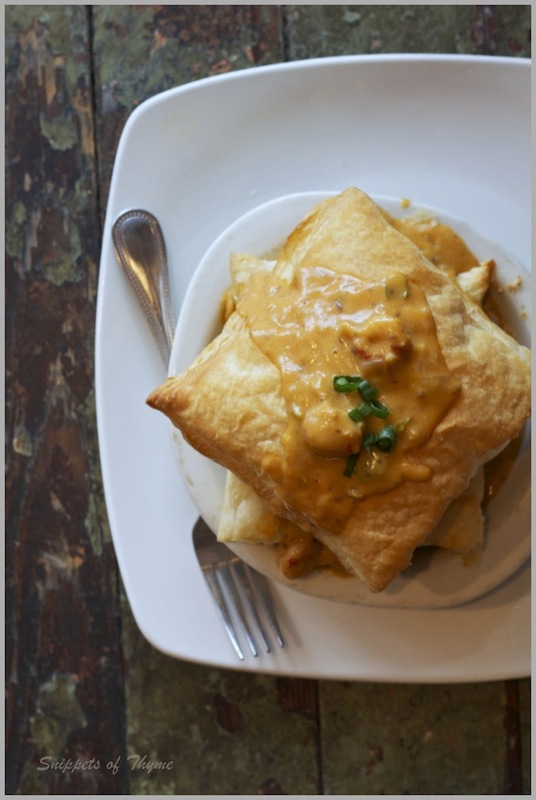 The dish I ordered for lunch was a layered crawfish medley inbetween fluffy puff pastry. The presentation of this dish was fun and attractive. However, I was still happily lingering over the wonderful flavors of that rice dressing, as well as the deliciousness of the crawfish cornbread...and the perfectly flavored maque choux corn. 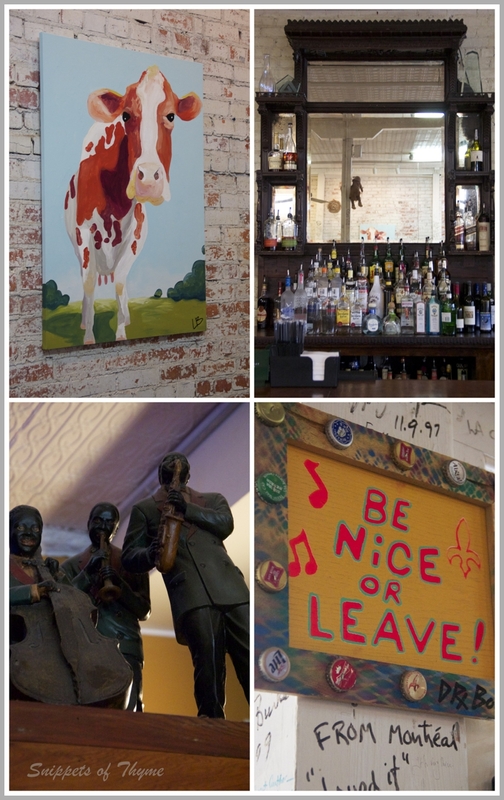 Café des Amis has all sorts of amusing stories to add to its quirky stylishness. In the late 1800's, the building that now houses Café des Amis had one of the first hand cranked elevators in town. The restaurant managed to preserve a portion of the elevator crank shaft. Its heavy black iron structure towers above the hostess station right when you enter the restaurant and makes a wonderful presentation. So, dessert rolled around. I was really so pleased with the savory menu that I planned to pass on anything sweet. 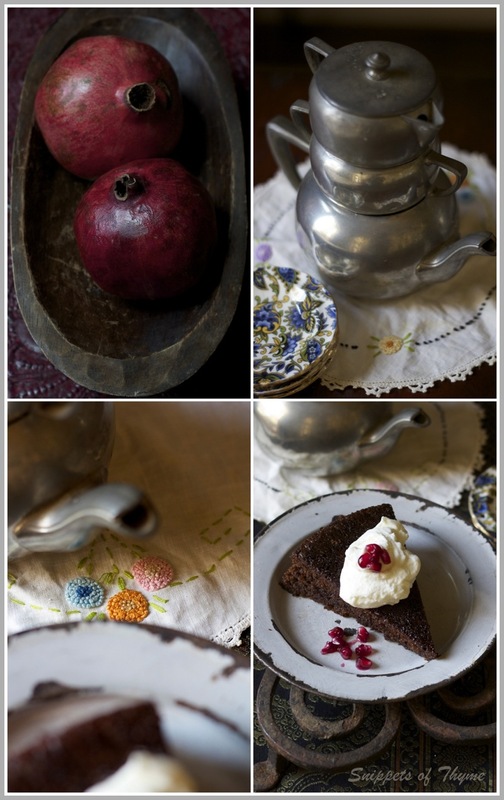 But, the Gateau de Sirop caught my attention so I chatted with Logan about it. As she brought a piece to the table, I noticed the intriguing darkness of the cake. 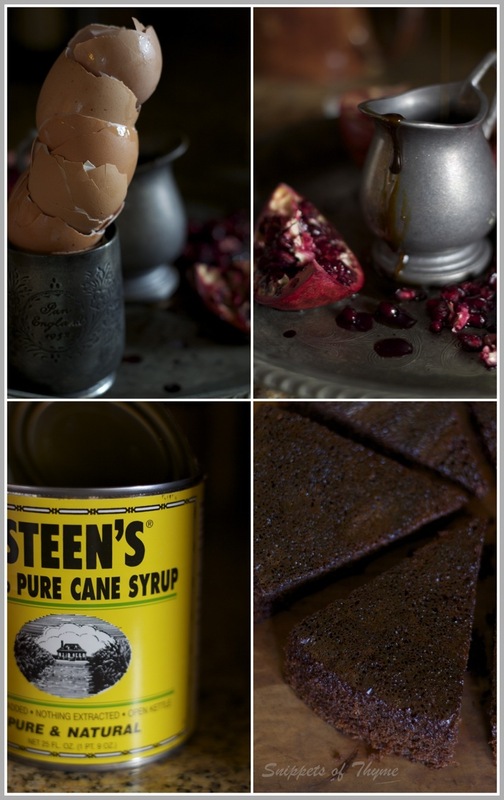 The molasses and cane sugar make this dessert an almost black color. The aroma of the spices immediately tickled my nose. I was thrilled that I had not passed on it. 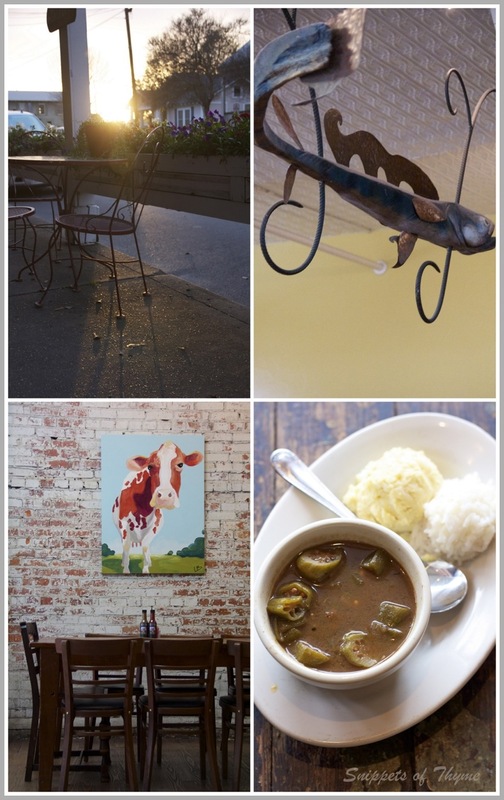 Breaux Bridge is as classic a small cajun town as it gets. Country living is at its truest. 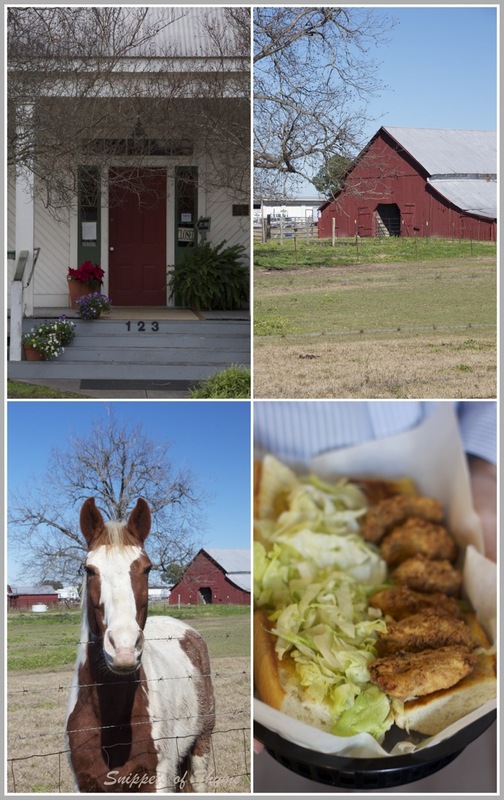 This is a small friendly chatty community that loves their heritage and good cajun food. I returned home inspired to recreate their gumbo here, but what most intrigued me was trying my hand at making that gorgeous and delicious Gateau de Sirop. 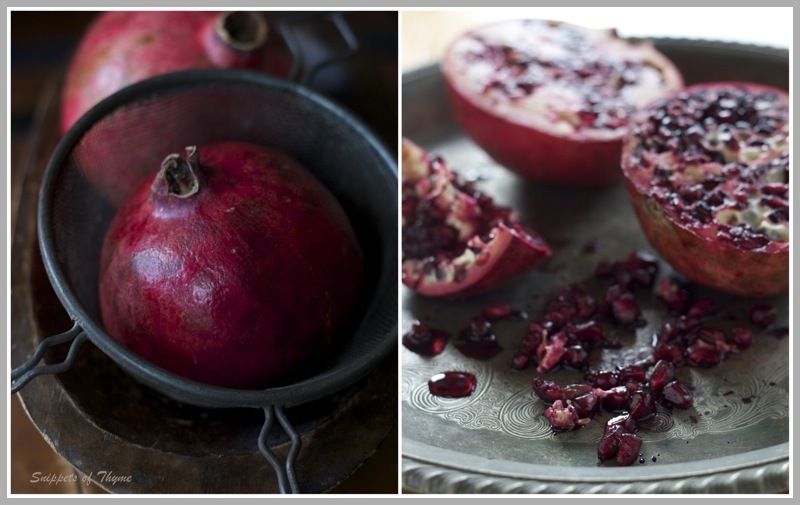 I saw these Pomegranates at the market and thought how well their shimmering ruby colored seeds would pair nicely with the cinnamon/molasses/syrup infused blackness of this simple cake. The cane syrup that I used came from another small cajun town called Abbeville. 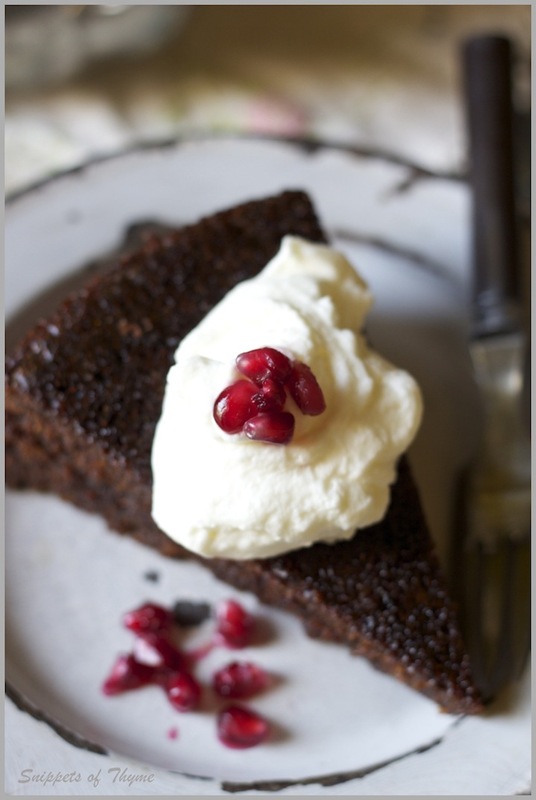 This and the molasses are what give the cake its stunning dark color. The recipe calls for Crème Anglaise. I did make this deeply flavorful bourbon kissed cream, but I also made a whipped bourbon laced cream. (for photographic purposes!). Both are delicious but Crème Anglaise is "over the top" good. 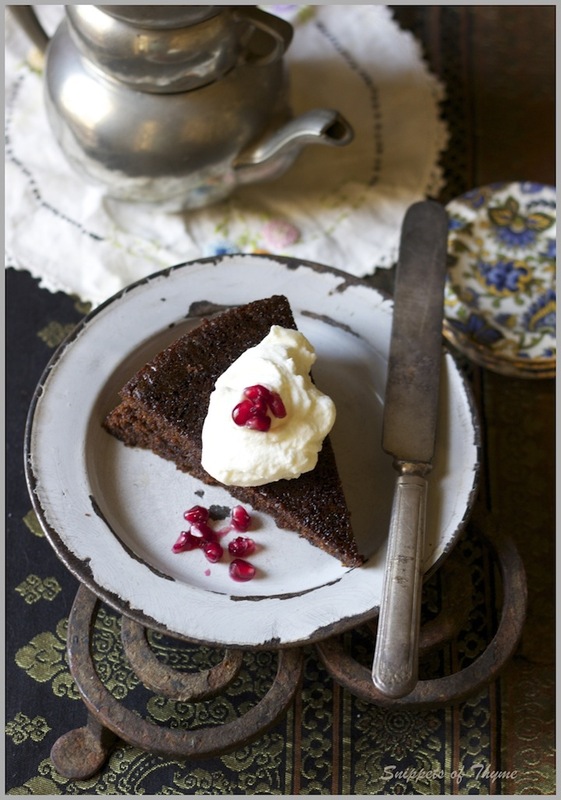 and indulge in a beautiful slice of this french cajun inspired Gateau de Sirop. This recipe makes about 1 1/2 dozen large muffins.They also freeze beautifully. If using a round cake pan, makes 8 slices. Preheat the over to 350˚ F degrees. Combine the oil, cane syrup and molasses in a bowl. In a separate bowl, stir baking soda into boiling water. (Snippet's Notes: be sure the baking soda is dissolved in the hot water) Add to the oil, syrup and molasses mixture. Add all other remaining ingredients and beat well at medium to high speed with an electric mixer. Be sure that everything is mixed in really well before pouring into baking pan. Fill large muffin tins, sprayed with nonstick vegetable spray, about three-fourths full. (Snippet's Notes: the first time, I filled them too high and the batter spilled over the tins.) Bake at 350˚ F degrees until they almost set, about 15 minutes. Add the chopped pecans on top (if desired) and continue baking until the muffins are completely set. Transfer the mixture to a saucepan and stir over very low heat with a wooden spoon. Cook, stirring, without boiling until the sauce coats the back of the spoon. Do not over cook or it will curdle. Stir in the bourbon. Serve warm or chilled.